Looking for something to break the chill this coming winter? Maybe a gift for someone very special? This cowl is worked in Trio by Brooks Farm Yarn, a yummy wool, silk and alpaca worsted weight yarn with 420yds/6 ounce skein. 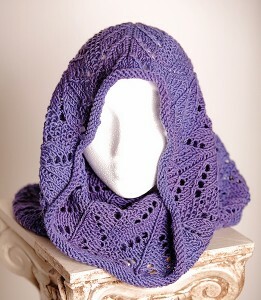 Worked in the round this simple lace will combine with the hand-dyed yarn to give you a simply stunning cowl!